After purchasing a lifesaving defibrillator, it is important that you know how to use it in the case of an emergency. This A4 poster will be able to guide an untrained rescuer through the process to ensure effective treatment is administered. 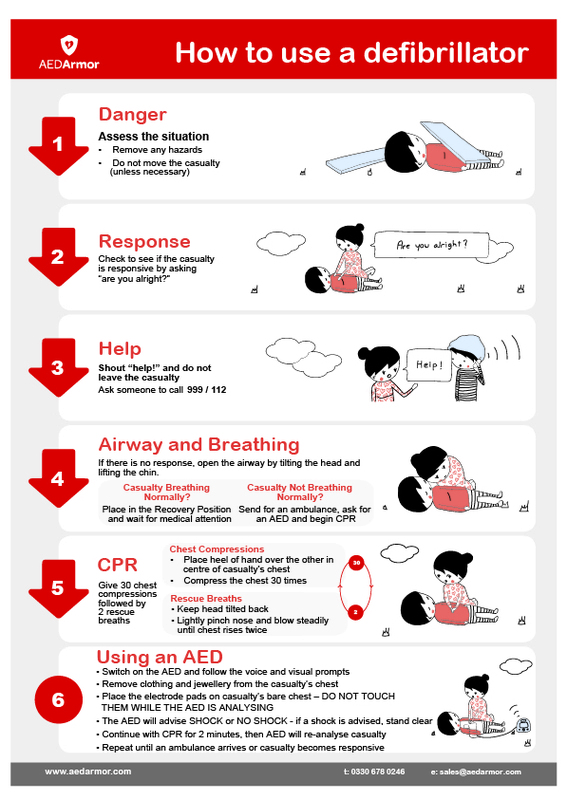 The A4 ‘How to use a Defibrillator’ Quick Reference poster is designed with the purpose to remind you of the steps to take when using a defibrillator in an emergency situation. The wall sign can accompany your AED perfectly, offering a constant reminder as to how to use a defibrillator as all the key information is provided. Designed to stick onto the wall close to your defibrillator, this A4 ‘How to use a Defibrillator’ poster ensures that anyone responding to an emergency situation could use it to refer to if they had no previous training. immediate minutes following a cardiac arrest, refreshing your first aid knowledge every time you walk past the sign. Do you have a question regarding this product, or any of the other products from the AED Armor range? We invite you to call our helpful advisors on 0845 071 0830.